The module may be used for implementation of multivariant comparative calculations, for example, for solution of the problem of the wheel tread profile optimization according to a contact fatigue criterion. • to represent processes of the stress modelling and the damage accumulation in the wheel with the help of graphic interface including isolines and coloring. The calculated equivalent stresses are compared with damaging ones according to RCF curve of the wheel steel, which obtained by processing of RCF tests results. RCF curve sets the dependence of the number of the cycles of variable stresses until arising fatigue defects from level of the equivalent stresses. The cumulative damage in the wheel point is determined using the RCF curve by summation of the calculated damages. A finite element (FE) model of the wheel fragment composed of the finite elements of the serendipity family with eight nodes and dimension of the edges of 1 mm are used in the module. The nodes of the FE model are convenient for accumulation of the contact fatigue damage. The proposed FE model allows to calculate the stresses in the near-surface layer of the wheel with the minimum computing time and the sufficient accuracy. The accumulated fatigue damages correspond to the one radial section of the wheel, which is contacted with a rail once during one revolution of the wheel. So, number of the contact problem solutions is equal to number of the wheel revolutions on the considered running distance. For solution of the rolling problem in the UM Loco module the model of contact forces of W. Kik and I. Piotrowski and the Kalker CONTACT model are used. With help of these algorithms the normal and tangential forces are calculated at the nodes of the 2D mesh located on the contact surface. As a result of simulation of dynamics of a railway vehicle using UM Loco module the input data file for UM RCF module is created, which contains the values of forces in the contact on each step of the traveled distance. For increasing speed of calculation of the stresses the FE fragment are separated from the initial FE model of wheel according to contact patch dimension. To the nodes located on all surfaces of the separated fragment except the contact surface the elastic constraints are applied. In the process of simulation of accumulation of RCF damage in the UM RCF module the obtained forces on each step of the traveled distance are applied to the nodes located on the contact surface of the separated FE fragment of the wheel. As a result of solution of the problem by FE method the equivalent stresses in the nodes of FE model are determined, which are compared with damaging values according to RCF curve of the wheel steel. RCF curves are constructed by processing RCF tests results. The test specimens were made from experimental castings of wheel steels having a different chemical composition. Three experimental castings covering the hardness range from 260 to 320 HB were selected for RCF curves constructing. RCF curves of wheel steel with different hardness are constructed to four RCF criteria. The obtained RCF curves can be used for modelling of the process of accumulation of the RCF damage for the wheel steels that are close in characteristics to the characteristics of experimental castings. The wheel wear iteration is a series of calculations within which the profile of the rolling surface of the wheel does not change. For accumulation of contact fatigue damage in the UM RCF module the FE model of the wheel fragment is used. At the each wheel wear iteration this model is reconstructed. A new FE mesh is constructed on the basis of the worn wheel profile. The damages calculated by means interpolation of the damages accumulated in the nodes of the mesh at the previous wheel wear iteration are assigned to the obtained nodes of the new mesh. Then the procedure of accumulation of RCF damage in the nodes of the new FE mesh of the wheel is repeated. The residual technological stresses occurring in the process of manufacturing the wheels and the mounting stresses caused by the interference fit of the wheel rim on the wheel plate can be represented as stationary fields in the wheel material. Since the problems of determining such stresses are solved in the axisymmetric formulation, the obtained stress distributions are attributed to one radial section of the wheel. In process of simulation of the accumulation of RCF damage the field of the alternating loading stresses obtained from the solution of the contact problem is superimposed on the stationary field of the residual stresses, the normal and shear stresses of both fields are summed. Then the value of the criterion of the RCF failure in the nodes of the FE mesh located in the radial section of the wheel is calculated. The UM library includes two sample files with data of the residual technological stresses in the material of the all-rolled car wheel and the mounting stresses in the material of the locomotive wheel. The files have a simple structure described in UM manual, that allows the user to create and include in the calculation the files with own data. 1. Sakalo V., Sakalo A., Tomashevskiy S., Kerentcev D. Computer modelling of process of accumulation of rolling contact fatigue damage in railway wheels. International Journal of Fatigue 2018;111:7–15. 2. Sakalo A.V. 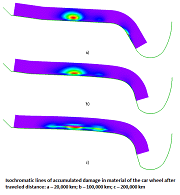 Improvement of the railway wheel tread profile according to a contact fatigue criterion. In: PhD Thesis Moscow State University of Railway Engineering (MIIT), Moscow, 2011 (in Russian). 3. Sakalo A.V. Simulation of accumulation of contact fatigue damages in railway wheel by using finite element fragments on elastic foundation. Vestnik of the Railway Research Institute 2011;4:44–49 (in Russian). 4. Sakalo V.I., Sakalo A.V. Numerical method for solving the contact problems for the solid bodies using the finite element fragments on the elastic foundation. In: Proc. of the 1st joint int. conf. on multibody system dynamics, Lappeenranta; 2010. p. 366–373. 5. Sakalo A.V. Method of simulation of contact stresses by using finite element fragments on elastic foundation. Herald of the VSTU 2009;9:71–76 (in Russian).